Foraging is particularly fashionable in the UK, as those who watch UK cooking competition shows on TV are probably aware. The idea is that one goes out to the forest or countryside and finds ingredients growing naturally that are not available in shops. The plants will be especially fresh and tasty because they will be eaten soon after being collected, and they will make one's meal unique and can draw on traditional recipes that are part of rural traditions.. A familiar example comes from picking wild mushrooms. But mushrooms are a salient example because although they can be delicious, there is also a danger if one makes a mistake, one can end up with a poisonous mushroom. Even if one does not make such a drastic mistake, there is always a worry about whether one has found the right plant, and a mistake can lead to an unappetizing meal. So one wants to know what one is doing. A book like Food You Can Forage can provide a useful start to the enterprise. Of course smart phones now can be loaded with apps that identify plants, and there are some apps specifically designed for foraging. Of course, these apps may also not deliver a perfect result, and can provide "likely" results rather than certainty. There are websites such as Falling Fruit that provide guides to plants that can be foraged all over the world -- with an associated app. They reveal that one can forage in cities and in suburban areas as well as in the countryside. Food You Can Forage is divided into several sections: woodlands, coastlines, heathland, meadows, and recipes. In each section, there are many pages of edible plants and fruits that you can find. For each one, there are several photographs, along with text describing where they can be found, what they taste like, and how they can be prepared with other food. There are plenty of familiar plants such as dandelions and chives, but also many that will be new to most, such as pignut, lovage, and bitter vetch. The photographs are beautiful with plenty of color and they make the plants look appetizing. The recipe section isn't long and so it will provide more of an inspiration than a useful guide to how best to use the exotic ingredients one collects. Being focused on Britain, the book may be of less use to those living in other areas. Since the number of foraging books is growing, other books may be more useful for readers in other areas. 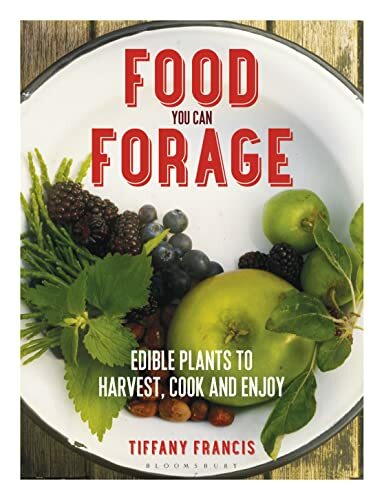 But for those who do live in the UK, this should be a helpful guide, and could be a nice gift for someone who hadn't previously contemplated foraging but who is a foodie.